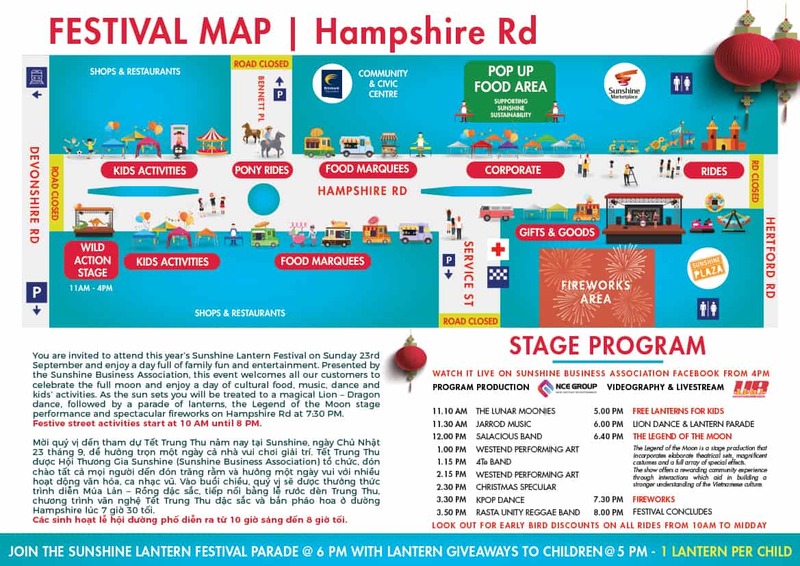 The Sunshine Lantern Festival is a free community event that takes place in the busy Sunshine shopping precinct along Hampshire Road, Sunshine annually in September. This year date is to be confirmed from 10am to 8pm. It is a full day of family fun, entertainment, rides, street performers, music, food of many nations, magical Lion and Dragon Dancing, a Lantern Parade to celebrate the full moon and ending with spectacular fireworks at 7.30pm to 7.45pm. Please make sure all pets are kept indoors. Crowds of up to 55,000 people come to enjoy the vibrant multicultural festivities and support the local businesses of Sunshine. 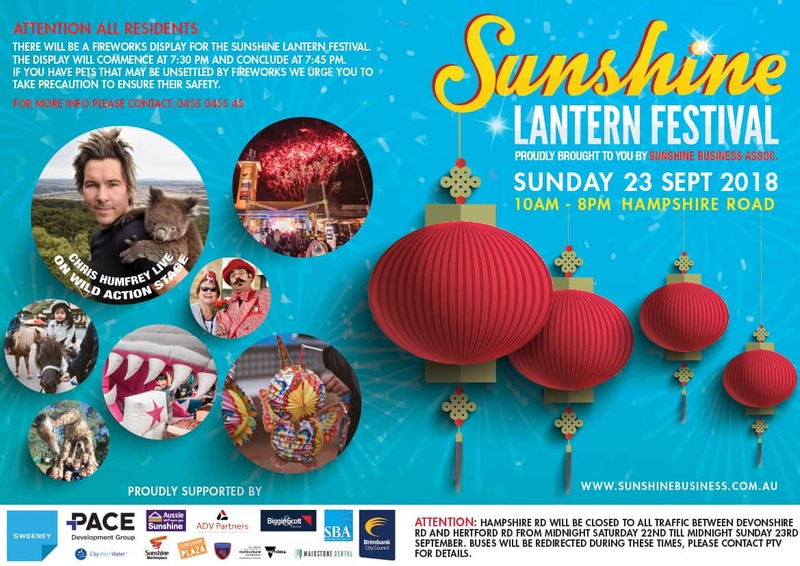 The Sunshine Lantern Festival is a popular traditional event celebrated in Vietnam and many other South-East Asian communities and here in Sunshine it brings our culturally diverse community together in a safe and fun environment while supporting our local businesses. 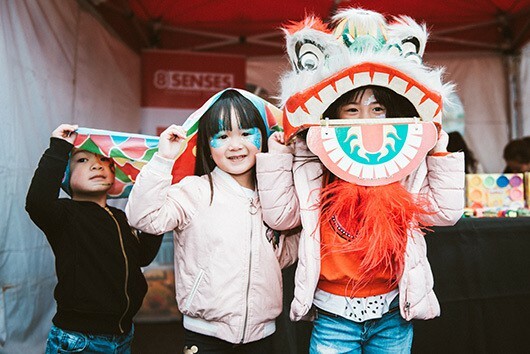 From humble beginnings in 2009, it is now one of the biggest one-day community festivals in the west and the largest Lantern Festival in Victoria. This year the bustling Hampshire Road, between Devonshire Road and Hertford Road will be closed to all traffic and will come alive with roving street performers, entertainment, children’s rides, jumping castles, pony rides, market stalls, street food, face-painting, lantern making and more. Look out for Gemma the Giraffe, Spiderman, Black Panther, The Luna Moonies and TV personality Chris Humfrey with a Wild Action stage show at 12pm, 1.30pm & 3pm with Australian native animals; that kids can actually touch. A large performance stage and a seating area will burst with local multicultural live entertainment and the Vietnamese cultural Legend of the Moon performance. Later in the day a vibrant and energetic Lion and Dragon dance complete with long string fireworks takes place along the Hampshire Road shopfronts leading a parade of children and their following families. The parade is filled with light from 1,000’s of led battery powered animal shaped lanterns given to children earlier and always ending with an exciting display of Fireworks. 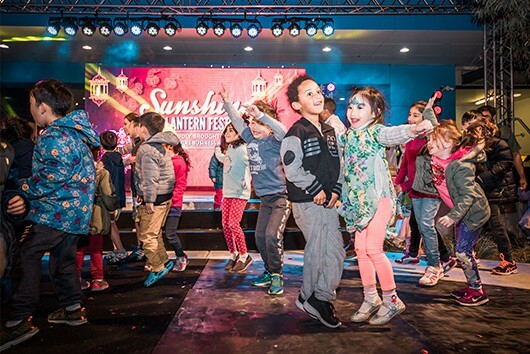 The Sunshine Lantern Parade is a free cultural community event staged and presented by the Sunshine Business Association, supported by Brimbank City Council and Multicultural Victoria. 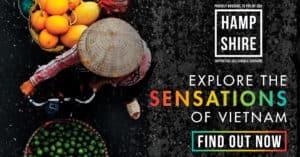 Located at the front of Sunshine Marketplace, ‘HAMPSHIRE SQUARE’ is a new VIP food space that offers visitors Vietnamese food from VN Wrap n Roll, Oldman Pho, Che Dessert & a sustainable gift from MOC all for only $20. 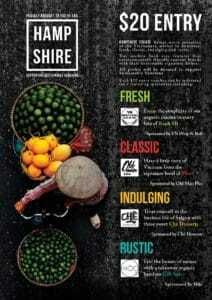 This space supports our ongoing Sustainable Sunshine campaign using all sustainable containers and utensils. Open from 1.30pm to 5pm. 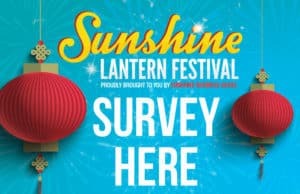 TELL US WHAT YOU THOUGHT ABOUT THIS YEARS SUNSHINE LANTERN FESTIVAL - SO WE CAN MAKE IT BETTER NEXT YEAR. Looking to be a Stall Holder? The 2018 Sunshine Lantern Festival Committee invites Corporate, Food and Goods Stallholders to participate by filling in the Contact Us form. If you are a community group wanting a stall, a street or stage performer wanting to participate please contact us.